Gartner 2017 Magic Quadrant for Data Science Platforms vs its 2016 version and identify notable changes for leaders and challengers, including IBM, SAS, RapidMiner, KNIME, MathWorks, Microsoft, and Quest. Gartner new 2017 Magic Quadrant for Data Science Platforms (called in 2016 “Advanced Analytics Platforms”) was published last week. The 2017 report evaluated a new set of 16 analytics and data science firms over 15 criteria and placed them in 4 quadrants, based on completeness of vision and ability to execute. 5 new firms were added in 2017 (MathWorks, H2O.ai, Dataiku, Domino Data Lab, and Teradata) and 5 others present in 2016 MQ were dropped: Lavastorm, Megaputer, Prognoz, Accenture, Predixion Software. 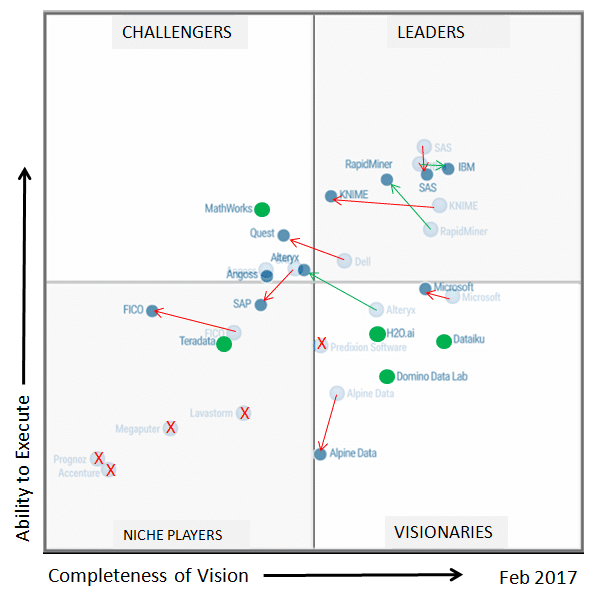 As we did in our popular post last year: Gartner 2016 Magic Quadrant for Advanced Analytics Platforms: gainers and losers, we compared 2017 Magic Quadrant with its 2016 version. Below we examine the changes, gainers, and losers. Fig 2 shows a comparison of 2016 MQ (greyed background image) and 2017 MQ (foreground image), with arrows connecting circles for the same firm. Arrows are colored green if the firm position improved significantly (further away from origin), red if the position became weaker. Green circles indicate new firms, while red Xs mark vendors dropped in 2017. The same 4 firms: IBM, SAS, RapidMiner, and KNIME, which were leaders in 2014-2016, are again in the leaders quadrant. Dell Software, sold in Nov 2016 and renamed Quest, and its Statistica Analytics suite moved from Leaders to Challengers quadrant. The 2017 MQ shows that IBM gained a little in vision, while SAS lost a little in ability to execute. RapidMiner gained in ability to execute, but both KNIME and RapidMiner lost in vision. IBM: is again a leader, based on SPSS Modeler and SPSS Statistics. Gartner did not evaluate IBM new Data Science Experience (DSx) platform but DSx contributed to IBM’s improved position along Vision axis. IBM strengths include its vast customer base and continued innovation of its data science and machine learning capabilities. However, IBM breadth of offerings (SPSS, IBM Watson, DSx, Cognos) creates some confusion in the market and SPSS line has interoperability problems. SAS provides a many software products for analytics and data science. Gartner evaluated covers SAS Enterprise Miner (EM) and the SAS Visual Analytics Suite (VAS). SAS is more focused now on interactive modeling with VAS, but continues to support its traditional base SAS. SAS retain a strong position in the Leaders quad, but confusion about its multiple products and concerns about high cost led to decline in Ability to Execute. KNIME offers open-source KNIME Analytics Platform with strong functionality for advanced data scientists. It is strong in several industries, especially in manufacturing and life sciences. It lost somewhat along the Vision dimension due to weaker marketing and innovation compared to other leaders. RapidMiner offers GUI-based data science platform, suitable for beginner and expert data scientists. It also offers access to open-source code. RapidMiner is available both as a free version and a commercial edition (with extra functionality for large data and connections to more data sources). RapidMiner is in leaders quad due to its market presence and well-rounded product. MathWorks is a new entry for its MATLAB product, popular with engineers, and providing a rich set of toolboxes. Quest, the result of the sale of Dell Software in 2016 to a private equity firm, now sells the Statistica Platform. Quest is in Challenger quad (while Dell was in Leaders quad) as a result of the second change of ownership of Statistica in 3 years and lack of cloud-related product improvements (which however are on the roadmap). Alteryx, offers an easy to use data science platform, with self-service data preparation and advanced analytics. It also added simulation and optimization capabilities. Compared to 2016, it moved from Visionaries to Challengers quad due to its solid customer growth. Angoss provides visual data mining and predictive analytics tools, as well as prescriptive analysis and optimization. Angoss remained in almost the same position in Cha quad as in 2016. Microsoft evaluation was based the Azure Machine Learning platform, part of the Microsoft Cortana Intelligence Suite, which offers a strong cloud-based data science platform. Gartner kept Microsoft in the visionaries quad, due to the lack of a comparable onsite solution. H2O.ai, a new entry, offer open-source data science platform with fast execution of Deep Learning and other advanced Machine Learning methods. Dataiku is a new entry, with its Data Science Studio (DSS). It was placed in Visionaries quad due to innovative nature of DSS, openness, collaboration features, and suitability for different skill levels. Domino Data Lab a new entry with its Domino Data Science Platform, which focuses collaboration and supports a wide range of open-source technologies. Alpine Data offer a “citizen data science” platform, Chorus, enabling collaboration between business analysts and front-line users in building and running analytic workflows. Compared to 2016, Alpine remained in Visionaries quadrant, but was dropped in its ability to execute due to its struggle to gain market share. SAP renamed its data science platform to SAP BusinessObjects Predictive Analytics. SAP decline in ability to execute caused it to drop from Challengers quad to Niche quad, and it is lagging in Spark integration, open-source and Python support, and cloud deployment. FICO Decision Management Suite (DMS) offers multiple analytic tools. It stayed in the niche quadrant in 2016, and lost a little along both dimensions. Teradata offers Aster Analytics platform, with 3 layers: analytic engines, prebuilt analytic functions, and the Aster AppCenter for analysis and connectivity to external BI tools. It is in the Niche quad to to low-level of adoption. 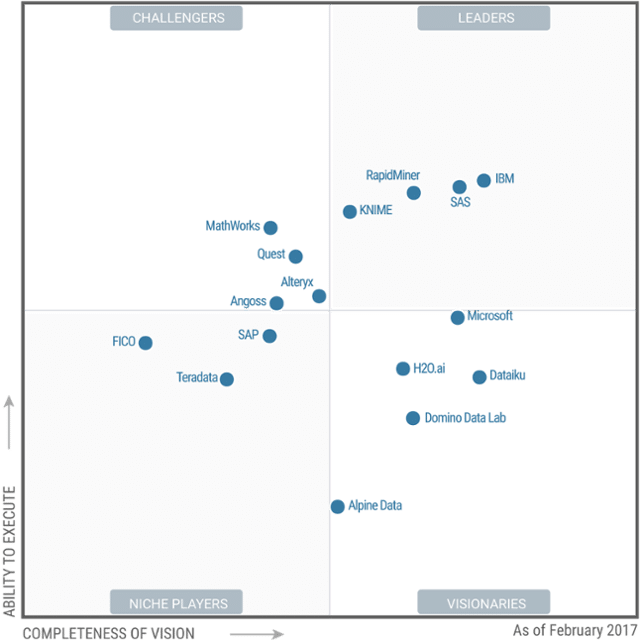 You can download the Gartner 2017 Magic Quadrant report for Advanced Analytics Platforms from RapidMiner, Dataiku, and probably other vendors favorably mentioned in this report. You can also download a related 2017 Gartner Magic Quadrant for BI & Analytics from Tableau.